At the weekend, The Sunday Times reported that Tower Hamlets council has started to encourage parents and teachers in its schools to report “concerns about young people’s safety, including racist or extremist behaviour”. The appeal by Tower Hamlets council will coincide with the publication of damning reports by Ofsted, the schools watchdog, this week, which will brand at least four schools in the borough “inadequate”. They include Sir John Cass’s Foundation and Redcoat School, a Church of England state secondary under the control of Tower Hamlets council, and three private Islamic schools: Al-Mizan primary, the London East Academy and Jamiatul Ummah secondary for boys. The first two are run by the East London Mosque Trust. 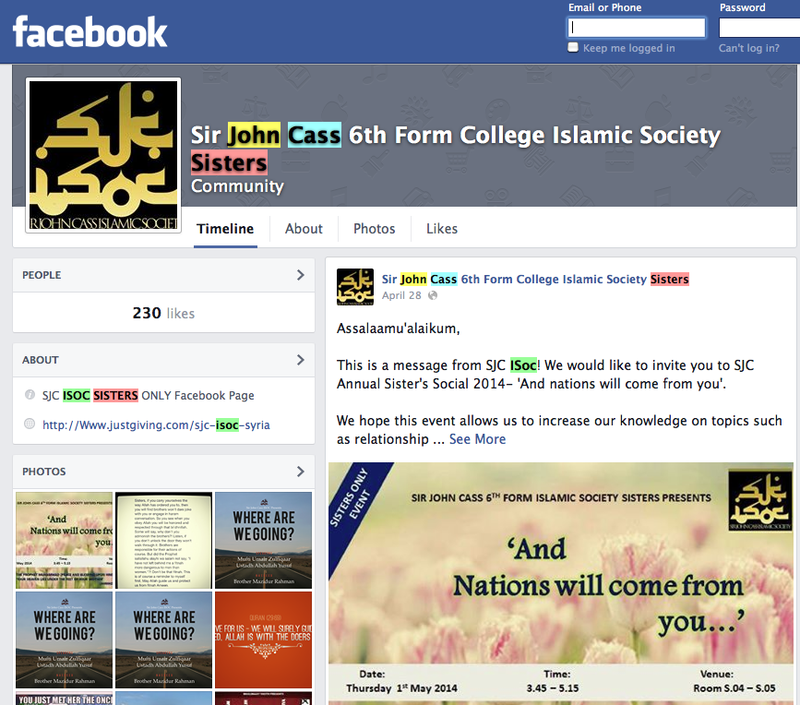 Inspectors who examined Sir John Cass are understood to have been alarmed at the slow response to claims about a Facebook page created by Muslim sixth formers that linked to an extremist speaker. The Ofsted reports will be published on Friday morning and they follow a number of “emergency inspections” over the past couple of months. Sources in Westminster have told me that Sir John Cass, in Stepney, will definitely be going into special measures because it has failed the “safeguarding” aspect of the inspection. A failure on that automatically triggers special measures, as I understand it. This will be devastating for the school, both for its students and staff. It genuinely is a “flagship” school. Its results are at the top end in the borough and it has in Haydn Evans a headteacher who is regarded as one of the best. He was awarded a CBE in the New Year’s Honours List for services to education and the last time the school was inspected it was rated “outstanding”, the highest ranking available. I hope he remains in place. And let’s be clear what this is not. It is not a failure by the council (whose senior managers, Anne Canning and Robert McCulloch-Graham, are also considered excellent). Neither is it a failure by or the fault of Mayor Lutfur Rahman: he’s understood to be angry at how the problems have come about. And nor is this Trojan Horse 2. In Birmingham, there was a said to be a subversive plot by governors to change the ethos of schools. At Sir John Cass, the apparent problems are rooted in the activities of some sixth form students themselves. The failures at Sir John Cass have arisen through a lack of governance oversight, or “grip” as they say in the Civil Service. Processes, and checks and balances are important, as PwC underlined in their report on council grants. The governance failures also raise some extremely interesting questions about freedom of expression, British values, religion and religious identity in state secondary schools. The Ofsted report will centre on several issues, but I suspect the headlines on Friday will centre on two things: the activities of the school’s sixth form Islamic Society (which uses school premises for meetings and which has been innocently raising cash for a charity under investigation for its activities in Syria); and the fact that the school allowed segregated playgrounds for boys and girls. On the second issue, which sounds disturbing, we’ll await the school’s explanation. On the first, Islamic Societies (ISOCs) at sixth form colleges and universities have been a headache for educational authorities and beyond for several years. Radical outfits such as Hizb ut-Tahrir see them as fertile recruiting grounds. Perhaps most notably, Ed Husain, one of the co-founders of the Quilliam Foundation counter-extremism think tank, was radicalised in the Nineties via the Islamic Society at Tower Hamlets College, Poplar. But I had no idea there were ISOCs in state secondary schools. However, I now understand this has been the case in Tower Hamlets for a few years. As far as I can make out, Mulberry School for Girls in Mile End also has one. One Bengali Muslim councillor in Tower Hamlets told me this week there was a concern that sixth formers were increasingly being encouraged by imams and Arabic teachers at after-hours supplementary schools to organise themselves this way. Of course, there’s nothing inherently wrong with ISOCs at school. Many schools have Christian Unions and Jewish Societies. It’s the activities that matter; and that’s why there needs to be good oversight by school authorities. 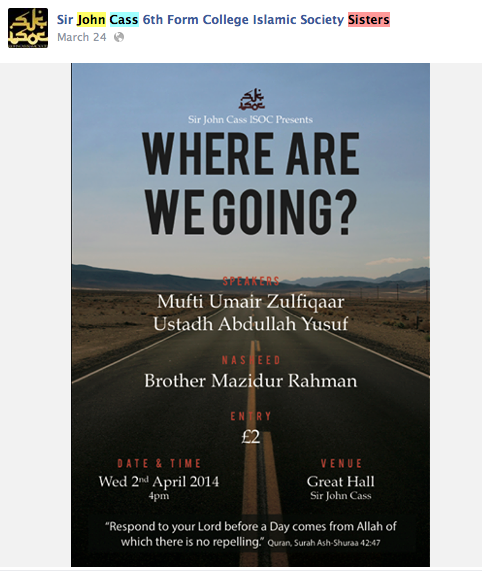 At Sir John Cass, the ISOC set up its own Facebook page and as I understand it, at least one link was posted on it to an extremist preacher. Apparently, the school bosses, who are responsible for the safeguarding of all students, failed to deal with this properly. It may well be there was other material on that Facebook page which also alarmed Ofsted’s inspectors. The Facebook page has now been deleted, but you can still find archived material for the SJC ISOC Sister’s page in Google’s cache. There’s nothing to suggest any of the speakers were, or are, of concern. So three innocuous videos and 57 views as of 5.30pm today. Hardly popular or dangerous. Human Aid, which is based in Whitechapel, is one of five UK charities operating in Syria that are currently under statutory investigation by the Charity Commission. Human Aid denies any wrongdoing on this. So that’s just a flavour of some of the potential problems faced by the school’s bosses when you have an active Islamic Society operating among impressionable teenagers in such a volatile climate for foreign affairs. They will probably seek guidance from ministers at the Department for Education. That all this is happening at a Church of England governed school, where 80 per cent of the pupils are Bengali Muslims (and where there is no religious assembly but a “thought for the day” broadcast over the tannoys, makes it more interesting. This was no subversive governors’ plot. The governors include(d) highly respected names. The Bishop of Stepney has a representative on the board. David Pascall CBE, a City financier, was until very recently the chair of governors. He has decided not serve another term and The Rev Trevor Critchlow, the Rector of the wonderful St Dunstan’s Church across the road from the school, has taken over. I would imagine action has already been taken in the relevant areas and I hope the special measures aren’t in place too long.